SKED ALERT! "DOCTOR WHO" - "COLD WAR"
Tonight, the Ice Warriors return to 'Doctor Who'! To wake up yesterday to the news that Jonathan Winters had passed away.... I can't tell you how much of a cultural hero he was to me. What I admired most was his fearless ability to work without a road map - he'd start an improv routine with no clue where he might end up. Sometimes it didn't work; but most of the time, he was able to spin comedy gold from that vast unexplored country of his mind. 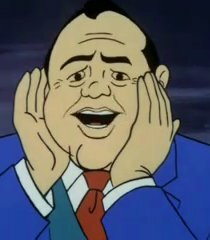 After running stopping at a gas station, the gang discovers that Jonathan Winters needs a ride to Maude Frickert’s Farm. When they arrive at the farm, the gang and Mr. Winters find a large man chasing two men off of the farm. 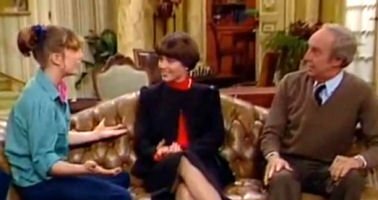 While trying to enter Maude's house, Mr. Winters and the gang get stopped by the large man who reveals that his name is Vernon Crow. Vernon thinks their trespassers. 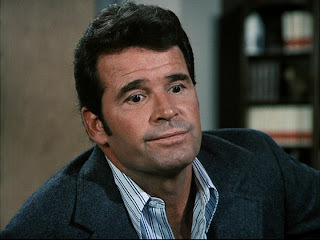 After Vernon says they won't get the secret formula, Mr. Winters tells Vernon that Mrs. Frickert is in the barn and she'll tell him who they are. Vernon walks up to the barn, and Mr. Winters does Mrs. Frickert's voice and makes Vernon let them in. "HAPPY ENDINGS" FOR "GAME OF THRONES"
Brad: Alex and Jane tried being honest with each other like 20 years ago. The fight lasted for weeks. The family calls it "the incident." When Brad found out that Max had "screwed the pooch" and told both of the Kerkevitch sisters all the smack they had been talking about each other behind their backs, he knew a Serbian bleep-storm* would be unleashed. Now, "winter is coming" on its own is just a sentence and doesn't have to infer any connection to the George R.R. Martin opus fantasy epic "A Song of Ice And Fire", now being adapted for HBO as 'Game of Thrones'. Thus, Zonk averted. So Toobworld Central has no fear of accepting Brad's quote for what it is - a reference to the brainchild of Mr. Martin. That would cause a massive Zonk if it weren't for the fact we already have a splainin in place. And if a certain rumor about the show's fourth season hold true, we'll have a new and more interesting splainin to replace it. Dorothy Stuart Hamill (born July 26, 1956) is an American figure skater. She is the 1976 Olympic champion in ladies' singles and the 1976 World champion. At the 1976 Winter Olympics in Innsbruck, Austria, Hamill came in second in the figures and then won the short and long programs, taking the gold medal. Before her free program, supporters held a sign saying, "Which of the West? Dorothy!" The sign was asking which skater would defeat East Germany's Christine Errath for the gold medal. Hamill initially misunderstood their intention and was hurt by the witch reference, but then realized it was a sign of support and it helped alleviate her pre-competition nerves. The nine judges gave her unanimous first-place votes. Hamill said that a competing skater and the skater's coach nearly hit her with a car during the 1976 Olympics. She does not believe the near-accident was intentional and has not publicly identified them. She was the last single skater to win the Olympics without a triple jump. Hamill also won the 1976 World Championships and then turned professional. Kimberly is overjoyed when Olympic Gold Medalist Dorothy Hamill sees great promise in her as a competitive figure skater, but she's even more astounded when Drummond agrees to let her leave the New York "nest" to train full time with the award-winning skater -- in Los Angeles. Near the end of the video, Sir Roger Moore and Ian Ogilvie share a phone conversation in which they discuss Simon Templar. Ogilvie sounds determined to wipe out the entire family line, while Moore cautions him that the world will always need a saint. In case you didn't know, both men played Templar in previous TV incarnations. Roger Moore will always be the perfect incarnation of 'The Saint' from back in the 1960s, while Ogilvie took on the role in the late 1970s. The IMDb lists Ogilvie's character as "The Fixer", but surprisingly there's no mention of Moore. It's highly doubtful that The Fixer was also the second Templar, but the possibility remains that Moore is playing the patriarch of Clan Templar. There's no problem if he's not, as so many TV characters resemble each other - that original Simon Templar looks just like Lord Bret Sinclair of 'The Persuaders!'. When the remake came out back in the late 70s, it was suggested that Ogilvie's Templar was the son of the original. This meant that at that same time on the networks there were two TV characters who could claim Roger Moore characters as "Daddy". The other one was Ben Maverick of 'Young Maverick' who was the son of Beau Maverick. Hopefully this TV movie of 'The Saint' will be on American TV this year. Whether it goes to series, is unknown. But at least the character will have re-established himself in Earth Prime-Time. Bobby Rydell (born Robert Louis Ridarelli, 26 April 1942, Philadelphia, Pennsylvania) is an Americanprofessional singer, mainly of rock and roll music. In the early 1960s he was considered a "teen idol". According to Allmusic music journalist Kim Summers, Rydell, whose interest in show business began at the age of four years, "is one of the most sought-after nightclub and concert acts in the US. His performance in "Bye Bye Birdie" and his recordings "Wild One" and "Volare" made him a famous performer in the 1960s. Rydell used his talents as an impersonator and drummer mostly in pursuing a musical rather than an acting career. 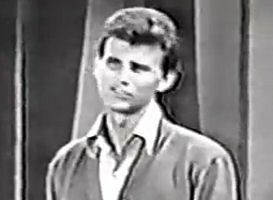 "Bobby Rydell Plugs Ellie's Song"
Special Guest Star Bobby Rydell sings to ease the tense situation between the Barneses, and is trapped into promoting an amateurish song composed by Ellie. 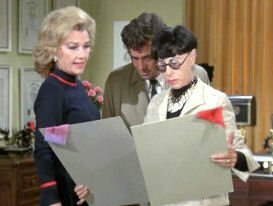 Head made a brief appearance in 'Columbo' - "Requiem for a Falling Star" (1973) acting as herself, the clothing designer for Anne Baxter's character. Her Oscars were displayed on a desk in the scene. 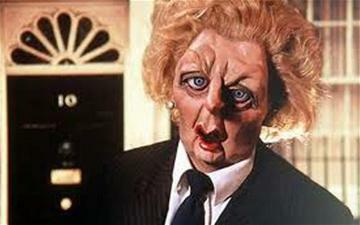 Baroness Margaret Thatcher has passed away. She was the only female prime minister of Great Britain and the only one of the 20th Century to have served three consecutive terms in the post. She was such a commanding presence on the world stage that she will continue to have her life portrayed in the Toobworld Dynamic across many TV dimensions, in much the same way has Marilyn Monroe, Abraham Lincoln, and JFK will. "Ben Elton: The Man from Auntie"
"Britney/Brittany" is the second episode of the second season of the American television series Glee, and the 24th episode overall. Written and directed by series creator Ryan Murphy, it premiered on the Fox network on September 28, 2010, and pays tribute to Britney Spears. Glee club member Brittany S. Pierce (Heather Morris) experiences an anesthesia-induced hallucination in which she recreates iconic Spears moments, and comes to self-realization, and several club members follow suit. Following the first season episode "The Power of Madonna", which served as an homage to Madonna, Murphy planned two tribute episodes for Glee's second season, of which "Britney/Brittany" is the first. He was approached by Spears about using her songs, and deemed her one of the most important female musicians of the decade, having inspired many of the show's young cast to pursue musical careers. Spears makes several cameos in the episode, appearing in the students' dream sequences. it is more like a big ball of wibbily wobbly timey wimey...stuff." "This is no time to go wobbly." I was going to state that few of the TV adaptations of Stephen King can bhe found in Earth Prime-Time, the Toobworld proper. the "Rekindled" version of "Firestarter"
The TV series 'Kingdom Hospital', 'Haven', and most of 'The Dead Zone' would be in the main Toobworld. ('The Dead Zone' switched over to an alternate TV dimension when the President of the United States was assassinated.) Some of the episodes from the anthology series 'Nightmares & Dreamscapes' might take place in Toobworld, but still others would have to be relegated to other worlds. And of course, as Monty Python would put it, 'The Stand' is right out! So I know nothing more about this new TV production, 'Under The Dome', other than the basic premise. But depending on how it concludes, at present I can see now reason why it can't be considered part of Earth Prime-Time. After all, the Toobworld Dynamic has been able to absorb the loss of a sizable chunk of a Los Angeles suburb (as seen in an episode of 'The Outer Limits') as well as alien invasions from - again - 'The Outer Limits', and 'The Twilight Zone', 'Doctor Who', and even 'Alfred Hitchcock Presents'. Frank John Gorshin, Jr. (April 5, 1933 – May 17, 2005) was an American actor and comedian. He was perhaps best known as an impressionist, with many guest appearances on 'The Ed Sullivan Show' and 'Tonight Starring Steve Allen'. His most famous acting role was as The Riddler in the 'Batman' live-action television series. I haven't been this excited by a musical discovery in a TV commercial since Nick Drake's "Pink Moon" was used for the Cabrio ad. Ending weeks of speculation, NBC confirmed today that after 22 years, Jay Leno will step down as the host of “The Tonight Show With Jay Leno” next spring. Jimmy Fallon, now the star of “Late Night With Jimmy Fallon,” will take over shortly thereafter. 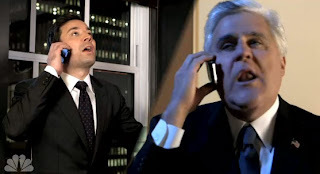 Another perk for Fallon? He won’t have to move cross-country, as production of 59-year-old “The Tonight Show” will move from Los Angeles to its original home at 30 Rock in New York City. No matter how he really felt about this situation and especially how it was (mis)handled, no one could deny Leno is a trooper.